The stock Notes.app provides a simple way for iOS users to take notes on their iPhone or iPad. The app features a minimalistic design and does not have any unnecessary clutter. However there’s still an important thing that is missing from this widely used app. Many of you may have noticed that there’s no way of knowing how many words you have typed in your note. While you wouldn’t normally care about the number of words in a short note or a grocery list you may want to know this information when dealing with a few paragraphs. 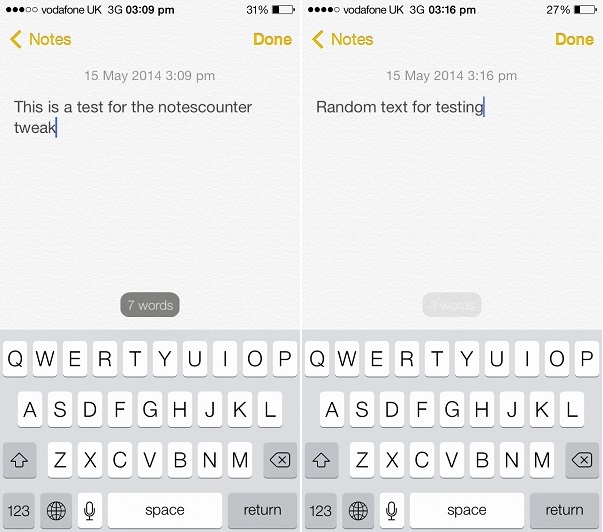 A new tweak called NotesCounter solves this problem by adding a live word counter to iOS 7’s notes app. The counter is added at the bottom side, right above the keyboard. The best thing about it is it looks pretty natural and works in real-time, which means as soon as you hit the space button the counter is updated to reflect the change. NotesCounter tweak also allows users to dim the appearance of the counter (see screenshot 2 above) if they find it distracting. When you turn your device in landscape mode and the counter will still appear on the screen. NotesCounter tweak works on all supported iOS 7 devices including iPhone, iPad and iPod touch and is available for free. It also works with iOS 6. See it in action in our demo video below.